This is such a great book – if I had read it when I was younger it would have been one of those books I read over and over again. It just has everything – great characters and a strong mythology all combined with wonderful writing. What more do you need? I was gripped from the beginning. Hannah is a great character and I loved her attitude from the onset. Yes, I imagine she could be slightly annoying at times but she was plucky enough that I really believed she could break the curse. As soon as we get to Scotland we are introduced to more wonderful characters. I loved them all and find it hard to pick a favourite but I did fall in love with Donavan and his quite and gentle ways. Linnet was also great! So much happens in this novel – magic, curses, time travel – and it all fits together seamlessly. I really believed in the world created here and it almost feels as if I could go to Scotland and find Wintersloe castle! The time travel aspect was my favourite and there was so much detail put into recreating the past – it really brought it alive and highlighted the differences from today. As for the ending it is just brilliant! Everything fitted together and I was really happy with how it all ended. It is aimed at a younger audience than I usually read (and review here) but please don’t let this put you off. I just loved it and can’t recommend it highly enough. I think I’m now going to have to track down everything Kate Forsyth has written! The Puzzle Ring can be purchased from Amazon or The Book depository. What inspired you to write the Puzzle Ring? 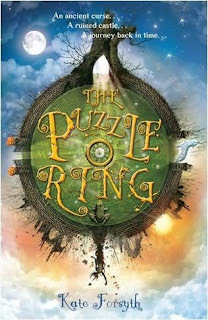 Although the first seed of the idea for the Puzzle Ring came from reading an article about the history of puzzle rings - which was first invented by a cruel and jealous Arabian king as a sort of chastity belt for his beautiful wife – I think this book has very deep roots into my childhood. I’ve always loved time travel stories, and I’ve always loved romantic old-fashioned stories about a child having to search for some kind of treasure to save the family castle. 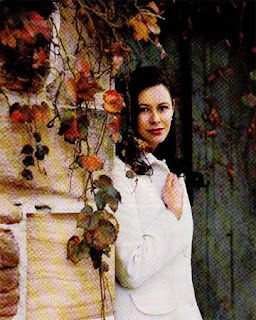 I wrote a book very like that when I was only 11 or 12, coincidentally set in the Highlands of Scotland. The Puzzle Ring really brings the past alive and I loved hearing about Mary, Queen of Scots. Is this a period that really interests you? Yes, its my favourite period of history. My fascination with Mary, Queen of Scots, first began when I was a child and my grandmother told me the story of the bloodstain on the floor of her bedchamber that never fades, no matter how hard the floor is scrubbed. Queen Mary was seven months pregnant when a gang of rebel lords broke into her bedchamber, where she was having supper with a group of friends, and stabbed her secretary David Rizzio to death in front of her – 56 dagger thrusts, one of each of the conspirators which included the queen’s own husband. David Rizzio fell and his blood poured out over her wooden floor. You can still see it on the floor of Holyrood Palace in Edinburgh – I’ve been there and I’ve seen it. Queen Mary was taken captive but she pretended to be so distraught that they left her alone. She knotted her bedclothes together and climbed out the window (remember she was 7 months pregnant!) and rode back to Edinburgh a week later at the head of an army, defeating the rebels and winning back her throne. I absolutely loved that story – she was my kind of queen! And the detail of the bloodstain that never fades just added to the general charm and romance and mystery and magic. My grandmother also told me that we were distantly related to the royal Stewart family, which just added to my fascination. I have no idea if this is true or not, though the great Scottish families were so inter-related I think most people of Scottish descent could claim the same! The Puzzle Ring is also a story of magic and curses. It contained so much detail it felt real! Is this a subject that really interests you? I’ve always been intrigued by the power of words. Curses and spells, wishes and prayers, they are all a way of trying to change the world with words. All of my books are filled with songs and incantations and spells, and quite a few curses too! Perhaps my fascination with curses comes from when I was in primary school and was being bullied mercilessly by the biggest, meanest girl in school. One day – when she had pinned my plaits to the back of my chair with some drawing pins, so I almost ripped my hair out by the roots when I tried to stand up – I told her I’d curse her if she was ever mean to me again. She laughed and gave me a chinese burn. So I went home and pricked my finger and I wrote her name on a piece of paper with my own blood, and then I burnt the paper in the flame of a candle, muttering a curse I’d written which went something like ‘by owl and bat and snake and rat, I curse you, I curse you, I curse you!’ The next day she fell down the steps and broke her leg. She never bullied me again (nor did anyone else) and I have never doubted the power of curses since. If you could have an adventure like Hannah when/where would you travel back to? So many times and places I’d like to go (as long as I could be sure of coming back again.) I’d like to go back and see my own Scottish ancestress and see how much truth is in all the old family myths (my sister has actually written a children’s book with this exact story line so it shoes the power of our old family stories!) I’d like to meet the Bronte sisters, I’d like to help Bonnie Prince Charlie escape, I’d like to smuggle French aristocrats away from the guillotine, I’d like to meet Mary, Queen of Scots and I’d like to know if she really did plan her second husband’s murder (I think she was framed). I’d like to have known lots of my favourite writers. I love the characters in the Puzzle Ring – especially Donavan. Did you base them on anyone you know? And do you have a favourite? Most of my characters seem to step fully grown out of my brain onto the page! I love it when that happens. Donovan is definitely one of my favourites– he’s exactly the sort of dreamy, romantic, rebellious, sensitive boy I’d like to have met when I was 13. And I like Hannah! She’s clever, bold and determined, all the things I was not when I was her age. Linnet is one of my all-time favourite creations too. I want her to come and live with me and cook for me! And Lady Wintersloe was party inspired by my own grandmother, who was very elegant and loved poetry and history and old tales too. Max was fun to write too! If the Puzzle Ring was made into a film (which would be amazing!) who would you want to cast as the characters? Ooooh! I’d like Saoirse Ronan as Hannah! She’s brilliant. (She’s was in Atonement and Death Defying Acts and The Lovely Bones). Can she sing, I wonder? Taylor Swift would be cool as Scarlett, though maybe she’s a little too old now – so maybe a younger version. It’d be hard to cast Donovan. He has to be able to sing and play the trumpet! Nick Jonas? He’s 18 so a bit old too. It’d be fun trying to find him! I love the Uk covers for The Puzzle Ring and The Gypsy Curse. Do you have any imput into these designs? Do you have a favourite? I love them both too. I had no input at all, but as soon s I saw it I was so happy. I particularly love ‘The Puzzle Ring’ because there is so much in it. My kids love poring over it, and identifying it all. What authors/books did you love when you were growing up? I read so many wonderful books as a child! Far too many to list. At one stage I was reading several books a day. By the time I left my primary school I had read every book in the library. The ones that stand out for me are Elizabeth Goudge, Lucy Boston, Susan Cooper, Ursula le Guin, Lloyd Alexander, Peter Dickinson, Enid Blyton, Edith Nesbit, Eleanor Farjeon, Alan Garner, Susan Cooper, Joan Aiken, Nicholas Stuart Grey ... I told you there were a few. I love these authors and collect their books. Some are very rare now and quite valuable. Did any of these inspire you to become a writer? I think I was born wanting to be a writer. I certainly don’t remember a time when it was my deepest longing, my most urgent desire, my most precious dream. I think I badly wanted to write books like the ones that so enchanted me as a child. And I wanted to live the life of a writer – or what I imagined a writer’s life would be like! I think this dream came from Enid Blyton’s autobiography ‘My Life’ which has lots of pictures of her sitting under a tree in a beautiful garden, typing away, a dog at her feet, servants quietly about their business in the background. Sigh. I’d still like that life! Fantastic post and review! Great to hear more about the history of Mary Queen of Scots too, she sounds pretty awesome. I can totally imagine Taylor Swift as Scarlett actually. this book does sound like it has everything. I've got to read it! And what a fun interview - I've never heard of most of the suthors she read growing up. I guess now I've got a ton more books to check out! Wow, great review. Fab that you enjoyed it so much. Loved the interview too. I know so much more about Mary Queen of Scots now. I never realised how much of a strong woman she was. Cool! I loved your review and I'm really happy you enjoyed the book! The interview is fascinating. Thanks for both! I'm reading this at the moment and am loving it! Great question about a movie - Saoirse Ronan would be a good choice! Brilliant review and interview! I loved The Puzzle Ring too so it's nice to read a bit more of it's background.